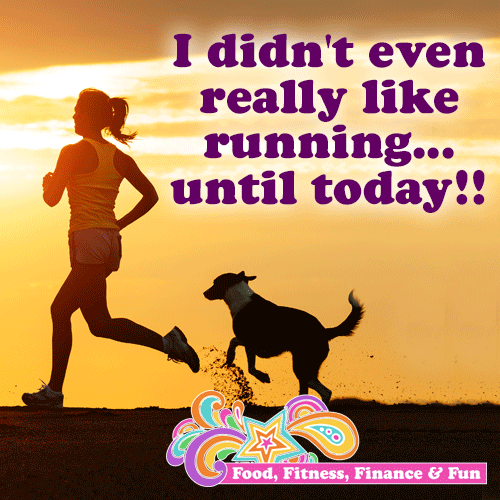 I didn’t even really like running…until today!! When I was a kid, running was just something I did to keep up if I wanted to play with other kids. Then when I got into team sports, here’s how it went down: I was the goalie for soccer, coach stuck me under the basket in basketball, I was short stop for softball, warmed the bench for volleyball, and I was on JV tennis and we had so many girls that we always just played doubles against each other and no one could complete a serve anyway! So as you can see, I have done very little running. I actually did run track in Junior High, I ran the mile, probably because no one else would, but I’m not sure that I ever enjoyed it. My senior year in High School I went out for the Cross Country team. I said it was to “stay in shape for swimming” but it was because I really wanted to lose weight since when I wasn’t swimming I would gain a few pounds. And I was the slowest one on the team. Running was so hard for me so I hated it. And being the last ranked on the team sucked! If you know how they score Cross Country, my race every week was torturous AND didn’t even count for the team. Double UGH! And the last time as a youngster I “tried” to be a runner was in college. To avoid the Freshman 15, I started to run. Again, it was so hard that I quit after 2 days and decided to become a speed walker instead. I was a speed walker until race day of my very first triathlon at the age of 27. I even trained for the 2 mile run with speed walking. The only reason I even ran in the race is because I really wanted to beat this one girl I knew. And then I decided I wanted to do an Ironman distance triathlon so I figured I better start running since there is a marathon involved. It’s harder to fake your way through 26.2 miles. But even after 10 years of Ironman distance triathlons, I STILL didn’t enjoy running. Running was just something I had to do to finish a triathlon. In 2013 I decided to do a running streak where I had to run at least 2 miles every single day, unless I was super sore from a race or long run or something then I could walk the 2 miles. After about 90 days I started looking forward to my runs, and it got me wondering what had changed. Starting most things in life are hard. A new job, a new habit, a workout program, having a baby, a new diet, etc. When something is hard, it is typically not enjoyable. Since running is hard (it’s one of the highest calorie burning forms of exercise out there), unless you are the 1% out there with natural running talent AND a runner’s build, it will probably not be fun in the beginning. However, the more you run, the easier it gets, and the easier it is, the more you will enjoy it. It makes sense! I think most people (including me) never did it enough to get to the point where it felt effortless. And only when it feels effortless will you actually love the feeling of running. So I began to enjoy running, I even considered myself a runner, but I didn’t really love it because it still felt like more work than I wanted it to. Tonight I decided to go to the gym after a long day of not having time to work out. I was a little anxious and overwhelmed all day (week, month) and ALMOST didn’t go since it was late and I never go to the gym at night, but my sister told me to go because I knew I would feel better after I went (thanks Kara). I walked in and the lights, sounds, smells, and energy made me feel instantly better. I hopped on one of the only open treadmills, turned on my favorite Pandora station (Pink), and pressed start. The belt started moving, slowly at first, then steadily up to where I typically warm up on a run. It felt like I was floating, barely touching the belt. I wasn’t thinking about my body, it just knew what to do next. I felt relaxed, like I had done this a thousand times before. I increased my speed 2 mph and it still felt easy. I just went with it. I looked around, smiled, and for the first time in my life, loved the way it felt to be running. The thousands of miles I had put in over the previous 13 years finally paid off. Clients tell me all the time “I wish I was a runner”. I believe if you WANT to be a runner, you can be a runner. Be patient with yourself, enjoy the process, and have fun. Enjoy the journey. I completely agree with Henry David Thoreau when he said “What you get by achieving your goals is not as important as what you become by achieving your goals.” I am who I am today partly due to the hours I have spent becoming a runner.